Particularly in the field of hygiene nonwovens, the trend goes towards products of a better quality with a smoother handle, more volume and of more uniform texture. Nonwovens producers worldwide are supported by the new BRÜCKNER SUPRA-FLOW BA belt oven, which gives them the technology to produce such high quality end products. The new SUPRA-FLOW BA guarantees a particularly gentle transport of the unbonded web. This is achieved by a sophisticated air circulation design. It is also characterised by minimum heat consumption, high flow uniformity and constant temperature distribution over the entire working width. The good accessibility of the oven chamber leads to a high maintenance friendliness. The dryer is available in working widths up to 4600 mm. It is designed for production speeds of up to 250 m/min and thus offers potential for line optimization. 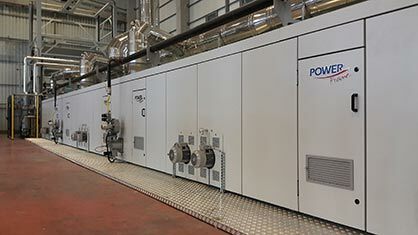 Typical end products, which are bonded on the BRÜCKNER SUPRA-FLOW BA high-end thermofusion oven according to the air-through principle, are nonwovens for diapers (ADL, topsheet, backsheet), nonwovens for feminine care and incontinence products but also filter nonwovens and special nonwovens. One year ago BRÜCKNER presented the revised double belt oven for thermofusion of high-loft nonwovens to the expert public. The aim was to reduce the use of primary energy with a view to resource-conserving nonwovens production and thus to reduce production costs. With the double belt furnace SUPRA-FLOW BX, established in the market, BRÜCKNER's engineers have succeeded in achieving not only this increase in efficiency, but also the re-construction of the air circulation with fewer individual parts in the sense of the guiding principle "a good design is simple". Furthermore there were many small detail improvements, which led to the fact that in 2018 so many SUPRA-FLOW BX were sold in different configurations, as never before. The oven is suitable for the production of high-loft nonwovens, medium as well as highly compressed fibre boards made of natural, synthetic and/or recycled fibres. It is a convective oven system which works according to the air-through principle. In each compartment the flow direction can be individually adjusted according to the product requirement. In most cases the basic material beside the matrix fibres are binding fibres melting at low temperatures such as bi-component fibres (PES/CoPES, PP/PR) and PP. Thermoplastic or duroplastic powders can be used also as binders. The SUPRA-FLOW BX is particularly suitable for products with a higher weight, thickness and/or density and relatively high pressure losses during the flow through the product. The following processes can be implemented on the system: Thermofusion (for bonding PP, PET/CoPET, PP/PE), heat-setting and drying. The SUPRA-FLOW BX is of particular interest to manufacturers of mattresses, duvets, inserts, insulation, furniture (upholstery, cushions), cleaning (dry and wet wipes, painter's cover foils), automotive components (headliners, thermal insulation, noise insulation, seat covers), thermal and acoustic insulation in the construction industry and carrier materials (floor coverings, technical coatings). This type of oven is particularly suitable for the gentle drying of binder-bonded lightweight nonwovens. 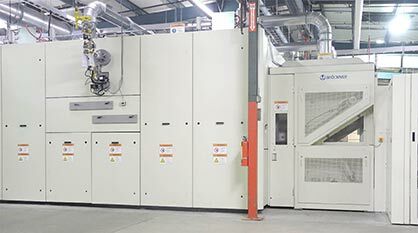 For such lines BRÜCKNER can supply the belt dryer type SUPRA-FLOW BE as well as the foam padder, the cylinder dryer group and a smoothing calender downstream of the dryer. The BRÜCKNER SUPRA-FLOW BE is successfully in operation and produces high-quality nonwovens for the medical sector. BRÜCKNER has again improved and further developed its minimum application unit. The customer has the following advantages over a padder: Low-Add-On technology (fabric moisture < 60 g/m²), low water consumption, high energy savings in the subsequent drying processes, low residual liquor (2.5 l per m working width) and thus fewer chemicals which have to be disposed of during a batch change. The ECO-COAT unit enables impregnation and precise one-sided Kiss Roll coating on the upper or lower side of the fabric web as well as functionalization such as hydrophobization or softener application by means of engraving roller pre-dosing. In addition, one-sided ink jet preparation is possible. Single-sided functionalizations with a wide variety of finishing chemicals can be realized, especially for fashion and technical applications. BRÜCKNER offers at any time the possibility to carry out tests on the laboratory plant in Leonberg with the advice of technologists.